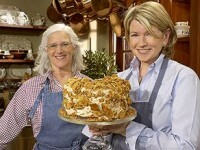 Here is a fun, delicious cake that Mary shared with Martha Stewart on her television show on April 7, 2003. Preheat oven to 325 degrees. In a large bowl, sift together the flour, 3/4 cup sugar, baking powder, and salt. Add 3/4 cup water, the oil, yolks, zest, and vanilla, and beat until smooth. In the bowl of an electric mixer fitted with the whisk attachment, whisk the egg whites on medium-high speed. With machine running, add remaining 3/4 cup sugar in a slow steady stream, beating until incorporated and stiff glossy peaks form. Remove bowl from mixer. Gently but thoroughly, fold beaten egg whites into batter, in two additions. Pour into a nonstick 10-inch tube pan. Bake until a toothpick inserted in the center comes out clean, about 1 hour. Remove from oven, and invert onto a narrow necked bottle. Let stand until cool, about 1 hour, before removing pan. Place cake on a serving platter. Cover cake with an even layer of frosting. Just before serving, sprinkle top and sides of cake generously with coffee crunch. In the bowl of an electric mixer fitted with the whisk attachment, whip the cream until stiff peaks form. Add coffee and sugar, and beat to combine. Use immediately. Lightly coat a rimmed baking sheet with oil; set aside. In a 4-quart saucepan, combine the sugar, coffee, and corn syrup. Bring to a boil. Cook over medium heat to just below the hard-crack stage (310 degrees on a candy thermometer). Remove from heat for 10 seconds. Sprinkle the baking soda evenly over sugar syrup. Whisk just until combined. Pour immediately onto the prepared baking sheet. Let stand until cool, about 30 minutes. When ready to use, tap the crunch lightly with a spoon or knife handle to crack. Break into irregular 1/4-to-1/2-inch pieces. Makes enough for one 10-inch cake.